Copyright © 2011 by Harlequin Enterprises Limited Cover Art used by arrangement with Harlequin Enterprises Limited ® and ™ are trademarks owned by Harlequin Enterprises Limited or its affiliated companies, used under license. 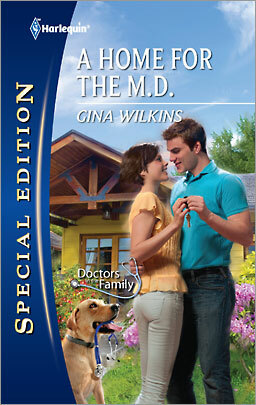 My newest book, A HOME FOR THE M.D., is available in stores and on-line this week. It’s the second in the Doctors in the Family series, but it’s a stand-alone story, so it won’t be a problem if you missed the first one, THE M.D. NEXT DOOR (which should still be available from eHarlequin.com). For a synopsis of the story, click on the Books Available Now tab above. You should notice something new about the cover of this book. Special Editions are now being published under the Harlequin imprint (formerly Silhouette Special Edition). I’ve always been extremely proud to be a Harlequin author and I’m pleased with their decision to consolidate all their lines under the long-respected Harlequin name. So look for A HOME FOR THE M.D. wherever Harlequin books are sold. The final book in the Doctors in the Family series, DOCTORS IN THE WEDDING, will be published in January, 2012. I wrote most of that story while I was in Seattle, sitting at a cozy little desk in a University of Washington library. That book will mark a milestone in my writing career that I’ll reveal in a later post. Now I’m brainstorming ideas for the following book. Coming up with new ideas is the fun part of my job. I tend to sit in my chair for several hours, staring into space while various possibilities float through my mind (and trying to convince my family that yes, I know it looks like I’m completely zoned out and lazy, but I’m really working!). Character names are very important to me. I can’t get to know the people in my story until I know their names. I skim through lists of baby names in books and on-line until certain names jump out and me and feel right for the still-vague personalities developing in my head. Naming my heroine and hero is always the first step in writing for me, and sometimes I change the names a couple of times before I find a “match” and can move on with the story. Once I know the characters a bit, I start to outline their adventure. What do they do for a living? What do they want most in life — and what’s holding them back from having it? What have I recently heard, seen or read that inspires a new storyline? A song? A news article? A funny anecdote told by a friend or family member? Several years ago, someone gave me a shirt that read: “Careful, what you say may appear in my next book.” I’ve always gotten a laugh from that, because it’s so true. It’s rare that I use real events in my books, but often something I’ve been told plants a seed of an idea that grows into a full-blown scene. My friends and family are long accustomed to seeing me get distracted while scenarios buzz through my head. “There she goes again telling stories to herself.” I’m so fortunate that I’ve been able to share those stories through my books. So, back to work. There’s an occupational therapist named Kim who’s tapping at my shoulder, whispering suggestions into my ear. No one but me can see her just yet, but I hope to introduce her to you sometime next year. In the meantime — be careful what you say around any writers you happen to know! Previous Post What month is it, again? I love this story – but have to say that Bungalow’s were the FIRST house type to include closets! As an architectural historian, I usually just skip building descriptions by most authors since they are just wrong. You, on the other hand, seem to be much better in this area. But part of the reason I love Bungalow’s (and I live in one I love them so much) is that they did have closets! Not big – and certainly not the walk-in closets of today- but closets none-the-less! Oops. Thank you for pointing this out and teaching me something new! I’m glad you enjoyed the story despite my error.